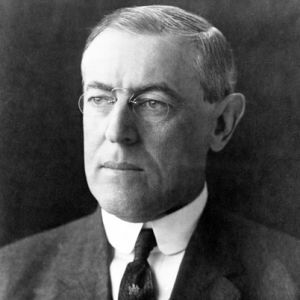 A century ago today, the United States Congress declared war on Germany, acting on a request from Democratic President Woodrow Wilson (below), and joined the Allied Powers in World War I. The declaration came as a result of German harassment of American shipping and the infamous telegram sent by German Foreign Minister Alfred Zimmermann to Mexico urging that country to join the German-led Central Powers alliance and invade the American Southwest to reclaim land ceded to the U.S. by Mexico in 1848. Wilson's call for America to "make the world safe for democracy" placed the U.S. on the world stage, bringing it out of its isolationist stance and priming it for the lead role it would play in World War II. But World War I, a hundred years after the United States entered it, remains a topic of disinterest in These States. Although a national World War I memorial is finally being built in Washington, Americans by and large seem to care little about the conflict and the social and political changes it wrought for the nation. Good grief, the Postal Service won't even issue a commemorative stamp for the centennial anniversary of American entry into World War I, preferring instead to honor Latin American cuisine. But then, when the war ended, Americans preferred to forget about it and tried to go back to a pre-war mindset in the 1920s - "back to normalcy," as Wilson's successor as President, Republican Warren Harding, called it. But too much had changed, what with urbanization and immigration changing the country's social fabric and America having to take more of a responsibility to help prevent a second world war, although it never joined the League of Nations, the organization that was Wilson's idea for keeping world peace. Wilson's Republican opponents in the Senate had rejected the Treaty of Versailles, which would have required American entry into the League; yet two Republican Secretaries of State in the 1920s, Charles Evans Hughes and Frank Kellogg, would later help broker agreements pertaining to peace and disarmament. Franklin Roosevelt, who had been an Assistant Secretary of the Navy under Wilson, would come to understand the value of internationalism. It's time for this country to reassess how it conducts itself in the world, as times are changing again and U.S. dominance is no longer assured. First, we have to look back at World War I and see how we got here in the first place.